Miller Schirger attorneys Steve Miller and Toby Hausner obtained an $883,465 award on behalf of Berkel & Company Contractors, Inc. against Phillips Hardy, Inc., following a one-week arbitration hearing. Berkel, a specialty deep foundations, shoring, and ground improvement subcontractor, installed sheeting and shoring on two highway projects for Phillips Hardy, a regional general contractor. Phillips Hardy refused to pay Berkel in full, claiming Berkel delayed the projects. The arbitrator rejected Phillips Hardy’s claims and awarded Berkel its full contract balances, its additional delay damages, plus attorney fees, costs, and interest. “We are thrilled to have obtained such a complete victory for our client, who was finally made whole,” said Miller. The Multi-Million Dollar Advocates Forum®, which recognizes one of the most prestigious groups of trial lawyers in the United States, is pleased to certify John J. Schirger, founding partner of Miller Schirger LLC, as a lifetime member. 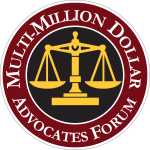 Forum membership is limited to attorneys who have won million and multi-million dollar verdicts, awards, or settlements. Forum membership encompasses excellence in advocacy. Fewer than 1% of U.S. attorneys are members. For over 25 years, John has represented businesses and individuals nationwide in cases involving business and commercial disputes, securities litigation matters and class actions. Miller Schirger, LLC, along with co-counsel Fraser Stryker PC LLO of Omaha, Nebraska, recently obtained a complete defense verdict for Rotella’s Italian Bakery, Inc., a Nebraska based bakery company, after a four-day federal jury trial. New York Department of Financial Services Proposes New Regulation Governing the Practice of Increases in Life Insurance Premiums.